2 visits on a Saturday afternoon while in the town for football. First visit at 2.15pm when the pub was busy (both bars), mainly with Dulwich Hamlet fans, a lot of people standing outside as the weather was good. 6 hand pumps with 4 ales on, 3 of them from Shepheard & Neame (it’s still a Shep’s tied pub), the other ale was Ranmore @ 3.8% from Surrey Hills Brewery, not a great pint but unsure if it was the ale or the condition but not that enjoyable. Another visit after the match when it was raining really hard so again both bars were busy. Pleased to report the landlord was in a happier mood than on my last visit, though him and staff are still slightly odd! Appears in the 2017 GBG. 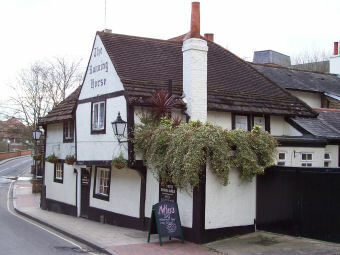 A nice looking pub with low beams and hops in the front bar, a raised area for diners, small courtyard style garden, the other bar is open plan with a pool table and jukebox. 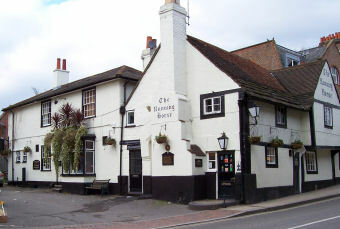 I was recently in Leatherhead on a Sunday and fancied a quick lunch time pint. 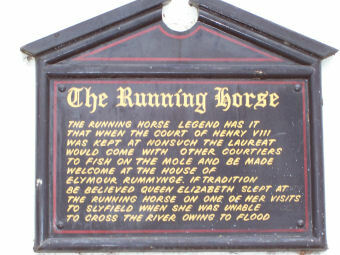 Being listed in the GBG, I headed for The Running Horse. As I was not eating, I was made to feel most uncomfortable by one of the bar staff and will not be returning. 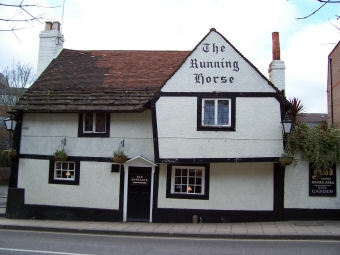 Having eaten at the 'Horse on Tuesday evening, it's probably a mercy the kitchen isn't open when walkers will be turning up. The food was dreadful. My burger was burnt and flavourless, in the cheapest supermarket bun - more raising agent than flour. The chips were dull, dry and flavourless. The salad was OK. My brother's bangers-and-mash in onion gravy turned out to be bangers and some sort of industrial instant-mash (either potato puree or powder) in bland gungy non-onion gravy which just contained a few burnt onions and no other vegetable matter. I was not impressed. This is a good pub to drink in if you like Thatcher's Gold cider (I do!) or Shepherd Neame beers, but I really would not recommend it for its food. I shall endeavour to try the food at the Penny Black - what I saw there looked much better. I should add, the kitchen isn't open through the afternoon, no food to be had between 3 and 6 - short-sighted considering its walker-friendly riverside location, methinks.